If you’ve ever wondered what’s behind your friends’ “It’s Complicated” relationship status on Facebook profiles, this film might be a good gauge – but only if those friends are your parents’ age. Nancy Meyers directs It’s Complicated, which has garnered her a nomination for Best Screenplay and Best Motion Picture in the Golden Globes. The romantic comedy veteran also directed What Women Want and Something’s Gotta Give, which shows us her ability in delving into the love life of women older than those you’d expect playing the lead in Hollywood. You could say she’s chasing after the silver dollar, seldom served by most of the Hollywood fare, but Meyers knows just what her audience wants, or at least dreams of. 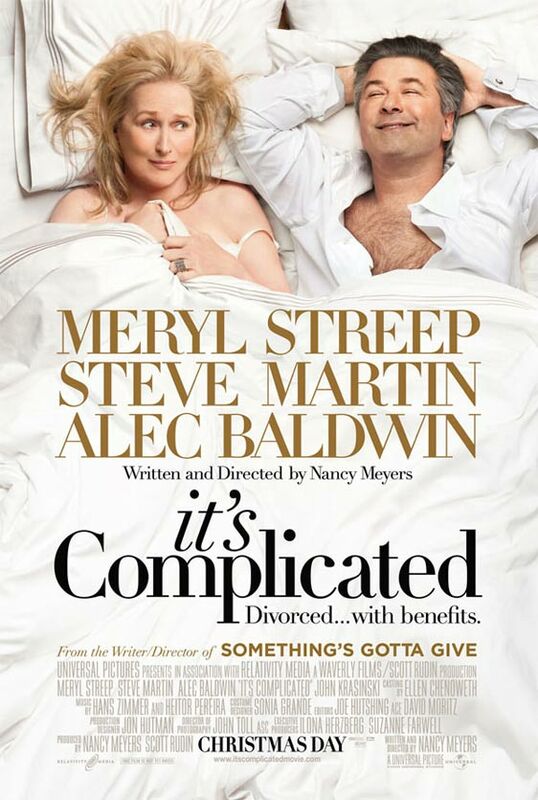 It’s Complicated is escapism for the middle-aged woman at its best. It’sany divorcee’s 2-pronged fantasy – getting back at the ex and finding love again. That doesn’t mean audiences in their 20s won’t enjoy this laugh out loud comedy though. 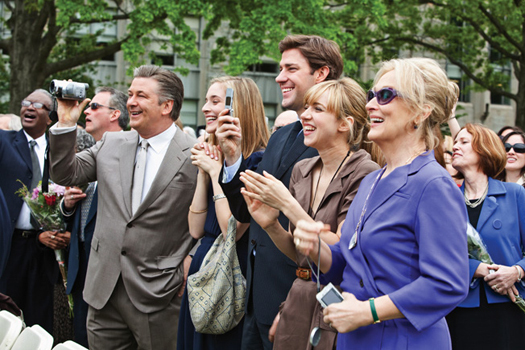 Meryl Streep plays Jane Adler, a self-reliant divorcee, who leads a Martha Steward-esque lifestyle. She lives in a dream house in picturesque Santa Barbara, runs a successful bakery, and also has supportive friends, a tight-knit family and an ideal son-in-law to-be. Along comes her ex-husband Jake (Alec Baldwin), who has remarried to a younger woman, yet is smitten by what Jane has blossomed into since the divorce. During their son’s graduation, they hook up after a drunken night out and old flames are fanned. But to complicate matters, Jane is also seeing Adam (Steve Martin), an architect hired to remodel her house. Not surprisingly, Streep, who holds the record for both Oscar and Golden Globe nominations, was nominated for Best Performance by an Actress in the Comedy or Musical category in the 67th Golden Globes for her role here. She only lost the award to her own performance in Julie & Julia. As usual, she does a fantastic job. As the confused divorcee, on the cusp of starting/restarting a relationship, she’s natural and a delight to watch as she convincingly teeters between her 2 suitors. It’s just 1 suitor less than what she had in 2008’s Mamma Mia! One can understand why she’s one of the few actresses in Hollywood who, even at her age, plays the lead, and gets the devilishly handsome man despite her less than stunning face. Any doubt that the 50-something-year-old cast won’t appeal to younger people was quelled by the sight of the cinema filled with 20-somethings, responding to the jokes with easy laughter. Who wouldn’t? The dialogue is funny and entertaining – for instance, Jake tells Jane “I’ve got 3 grown kids and I’m going to kindergarten interviews, I’m a walking cliché” – something people of any age group will enjoy. Younger audiences can also look out for John Krasinski. The actor, most well known for his role as Jim Halpert in The Office, a television mockumentary series, manages to inject comic relief, despite being cast as one of the secondary characters. In fact, as the oldest Alder daughter’s fiancé, the ‘outsider’ looking into the family drama supplies some of the better laughs in the film, mostly due to his amusing facial expressions. Central to the film is the idea that you can have fun at any season of life, and the oldies’ idea of fun is surprisingly similar to ours. Jane, Jake and Adam, all well in their 50s get away with acting like teenagers – they appear at parties high on pot (marijuana) and fall in and out of relationships. In contrast, their children (for the most part) are completely independent and behave more mature than their own parents. While an older audience might associate this with reliving their youth, younger audiences will find this fairly ridiculous. The real issue here though, is that you fail to sympathise with the right characters. Jake is an amusingly charming but obnoxious jerk of an ex who prances back into Jane’s life expecting eager arms. This is fine, except Adam’s nice guy architect, the one you should be rooting for, never gets fleshed out properly. He’s all smiles and sensitivity, but not much more than that. As a result, he remains 2 dimensional and uninteresting, and there’s minimal emotional investment in him all the way to the end of the film. The same goes for the 3 Adler children and Jane’s friends who only have brief appearances, and are conveniently ushered to the background so the affair can develop. Her friends don’t serve any other purpose in the film either, beyond serving as an outlet for Jane to share her confusion about her state of affairs. All in all, watch It’s Complicated as a date movie, or simply for entertainment, but don’t expect anything deeper than that or you’ll be in for disappointment. Ruby, Sparks or no Sparks?